As I briefly mentioned the other day, and I’m sure you’ve already had your fill of news about, Miracleman is finally returning to print next year, eventually culminating in unpublished and new work by Neil Gaiman and Mark Buckingham, who are going to continue from where they left off. 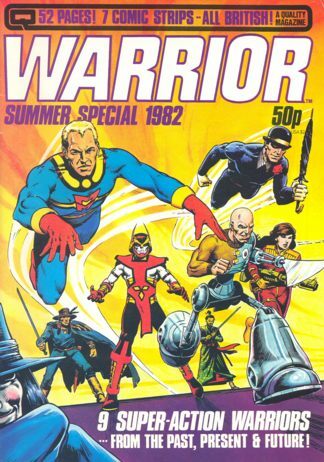 The initial reports were a bit vague on what exactly was going to be reprinted, resulting in some necessary clarification: they are going to start the reprints with Alan Moore and Garry Leach’s initial revival of the character from the early issues of Warrior , as reprinted by Eclipse in the 1980s. That of course means those of us who’ve been waiting…hold on, let me look it up…oh Good Lord, since mid-1993 for a follow-up to that bit of a cliffhanger Neil ‘n’ Mark left us on in #24 are going to have to wait a little while longer to see how that all plays out. 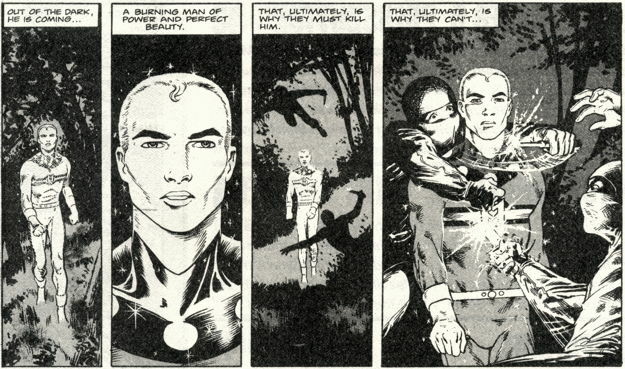 …it looks like we’re getting these Miracleman comics doled out to us on a periodical basis, each issue containing some kind of new content so sad old MM completists like me will probably buy them all despite already having the originals because we’re suckers. And hopefully it’ll sell well enough from the get-go to eventually make it to the promised new material, as I suspect there may be some cases of newcomers to the work going “pfffft THIS is what all the excitement’s about?” because they’ve been reading ripoffs and retreads of these stories for the last twenty years and now it’s all old hat to them. On the other hand, maybe it won’t take that long to get through all the old stuff to reach the new stuff since, as I noted at the end of this post, Marvel ain’t shy about turning the faucets open all the way and flooding the shelves as quickly as they’re able with successive issues of any given series. So, 24 reprint issues before getting new Miracleman? Eh, ten, eleven months, tops. Okay, technically 23 issues, since Eclipse’s #8 was a reprint issue, though with some new pin-ups and a brief framing sequence drawn by Chuck Austen (AKA Chuck Beckum). But then again, they could speed up the process by printing more stories per issue…the first seven issues of the Miracleman series featured stories told in 6 to 8 page chapters, mostly reprinted from the UK magazine Warrior (though some of the later chapters were drawn new from scripts that never made it into that magazine). And some of the follow-up “full-length” installments were only 16 pages long. I don’t know how economically feasible it is to put out a regular series of 48-pagers in order to squeeze in more material, nor do I think readers are going to want to pay the inevitable $4.99 to $6.99 per issue in order to subsidize the printing costs simply because I, your pal Mike, wants to get his filthy, filthy mitts on new Miracleman comics right this very second. I’ve seen it mentioned that the first issue includes material from Alan Davis, who didn’t start on the feature ’til its sixth chapter (which was reprinted in Eclipse MM #2) so maybe we are getting more miraclebang per buck in each issue. We’ll see. Most likely Marvel will stretch things out best as they’re able, and there are a handful of shorter Miracleman-related stories to round out any 32-page format comics containing just one 16-page main story. Maybe we’ll even get that bit of business from Warrior #4 that never made it to the States. And of course there’s that “new material” and interviews and such that Marvel noted in their press releases that will probably fill up any shortfall in any given issue. They also mention “the stories are being completely relettered to meet today’s standards,” which gives me the twitchy eyeball, as I recall certain other publishers relettering some high-profile reprint projects and introducing a whole new world of lovely typos and spelling errors into some classic material. Here’s hoping there’s no editing-by-spellcheck goin’ on this time. I do like the idea that they’re keeping the “Miracleman” name for this particular story started by Moore and (presumably) to be ended by Gaiman. I had assumed that the name change (originally necessitated by a U.S. publisher that wasn’t Marvel Comics reprinting the material) would be reversed now that Marvel does have the work under its banner, but it looks like they’re keeping the Miracleman name for this project, and “Marvelman” for when he’s in the actual Marvel Universe and joins the Thunderbolts or whatever. And I think that’s fine. It was pretty well known at the time that Eclipse had to change the character’s name to keep Marvel happy, but I came to know the feature as Miracleman, and it would feel strange to pick up the story again with his name changed back. Just one of those funny fanboy quirks, I know. Hey, I’m allowed one or two of those. 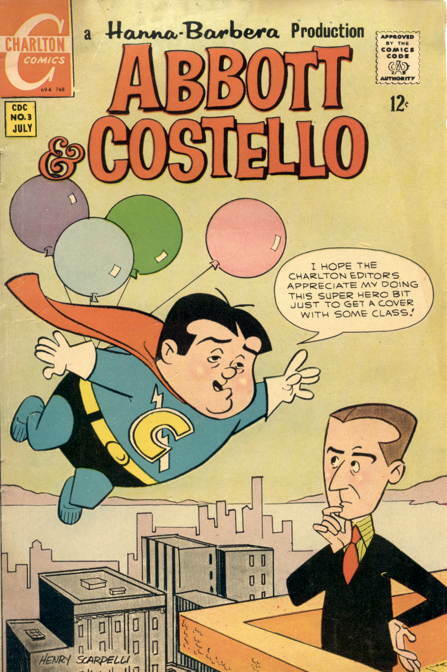 Of course, the Miracleman name could be a problem, too, if the publisher of this comic ever turns up with some ceasing-and-desisting. Yet another thing I had to get out of my head. Marvelman Special #1 (Quality, 1984) and Warrior #4 (Quality, 1982). We then get a handful of original 1950s Marvelman stories from Mick Anglo’s studio, including “Invaders from the Future,” a rescripted version of which was used in Eclipse Comics’ Miracleman #1 (providing an innocent contrast to the grim ‘n’ gritty revamp that followed, as well as simply introducing the character to an audience that may not have been familiar with it). 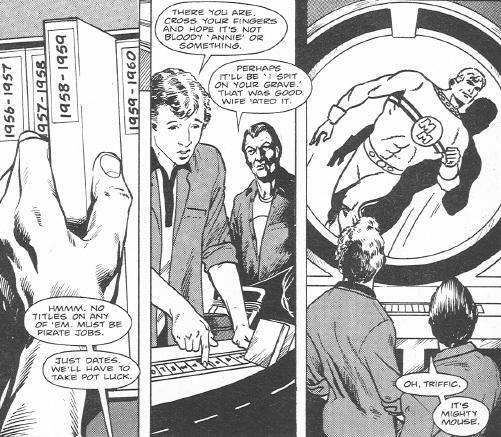 In the context of the Moore’s modernization of the character, these are some of the falsified adventures used as “programming” for Marvelman and his superpowered compatriots. Rounding out the mag is a story starring the more-lighthearted Big Ben character, which is also presented as a video being watched by the cleaning crew. Eclipse Comics did reprint this special (sans the Big Ben story) as the Miracleman 3-D Special in 1985. I acquired this particular magazine shortly after the launch of Eclipse’s Miracleman comic, as it had been sitting on the shelf at the comic store for several months and, being quite taken with the comic and character, finally decided I needed to have it. It’s been 25 years, so I don’t remember the exact timing, but I think I may have bought and read the magazine before the Eclipse reprints reached that point in continuity. It must have been a tantalizing glimpse of events yet to come, if in fact that was when I bought it. I do remember that owning this magazine is the reason I never bought the Miracleman 3-D Special , since, hey, I already had it, and didn’t need to wear the special glasses to read it. Warrior #4 contains the story “The Yesterday Gambit,” which is unique in that it’s the only Alan Moore Marvelman story not (yet?) reprinted in the U.S. Also, it takes place much later in Marvelman continuity, hinting at events that wouldn’t arrive in the Marvelman storyline for a few years to come. In fact, the original Marvelman run in Warrior would never reach that point…it wouldn’t until Eclipse Comics finished reprinting UK-published material and started running first run work created by Moore and his collaborators. Specifically, “The Yesterday Gambit” takes place during the events of issue #15, published in 1988. However, instead of reprinting the original story, Moore and artist John Totleben take a handful of panels to essentially retell that adventure’s events. The story itself is about Marvelman and a Warpsmith (a teleporting alien) traveling through time and trying to find sufficient energy and power for their final battle against a reawakened and totally evil Kid Marvelman. This is where the “tantalizing glimpse” aspect of the story comes in, because if I’ve figured the timing right, this story basically interrupted the adventure in progress from previous issues of Warrior …which just happened to be Marvelman’s first clash with the corrupt Kid Marvelman. And the story ends right after that, leaving the fans hanging for six years. And you folks who read Ultimate Wolverine Vs. Hulk thought you had it bad. Well, you did, but not for reasons of delay. Er, anyway. I didn’t buy Warrior #4 in the shop…I wasn’t even aware* that there was an unreprinted Moore Marvelman story until relatively recently, so I had to depend on the eBay to bring it to me. And I’m not bothering with the usual Amazon links on this, since I didn’t find Warrior after spending, oh, a whole 30 seconds looking for it, and the Special is under a handful of different names at prices ranging from $35 to (egads) $90. I paid $2 for mine, which is probably about right. And if you have to have the story, the U.S. 3D version should be relatively inexpensive. Oh, and I paid around $9, including shipping, for the Warrior mag, in case you’re wondering. And I know you are! * Or perhaps forgotten, because now that I think about it, it may have come up in the letters page at some point, and I’d just forgotten about it as the years passed and Miracleman remained a defunct title out of sight, out of mind. Hey, remember when Miracleman #8 finally came out and it was just 1950s Marvelman reprints and we were all totally annoyed? 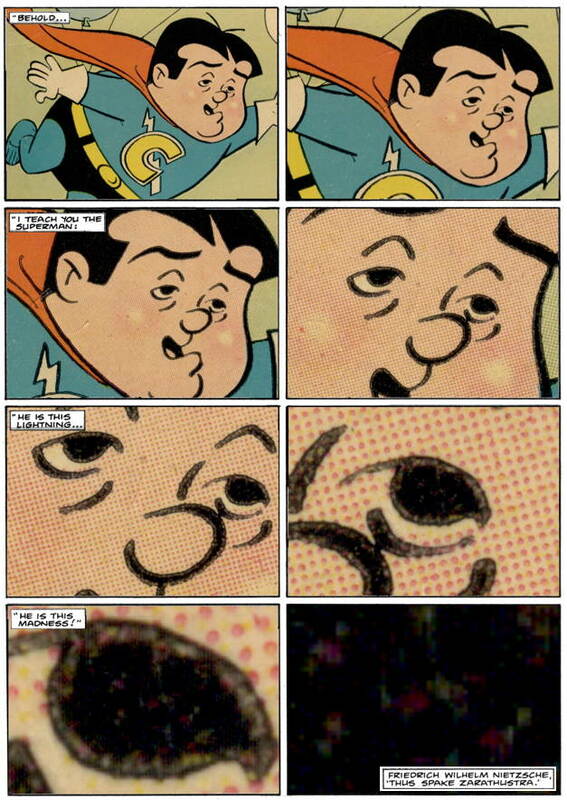 § July 28th, 2009 § Filed under miraclemarvelman Comments Off on Hey, remember when Miracleman #8 finally came out and it was just 1950s Marvelman reprints and we were all totally annoyed? Just thinking about that for some reason. As you’ve probably heard, Marvel Comics has acquired the publishing rights to Marvelman , which is kind of a big deal considering the convoluted ownership history of the character. Steve Bissette has a great run-down of just how much of a mess that history is. 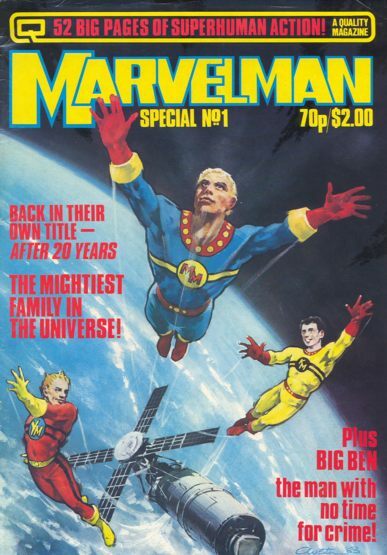 As Steve says, and as Alan Doane noted in that post of his I linked yesterday, this deal may not necessarily guarantee the release of what everyone actually wants: the Marvelman revival material from the ’80s (released as Miracleman by Eclipse Comics). Mark Buckingham, the series’ last artist, seems pretty upbeat about it, so we’ll see. I’m presuming Marvel didn’t go through the trouble just to have more 1950s material to put into expensive hardcover editions. Now wouldn’t that be a bit of ironic repeating of history? It would be like what happened with Miracleman #8 (where we waited what seemed like forever for the next chapter of the story, and got reprints instead), writ large. Anyway, what I wanted to mention was some of the online reaction to the news, a lot of which was along the lines of “so what?” “Who cares?” Or my favorite, “Yawn.” I don’t know, I think the possibility of the return to print of early comics work by Alan Moore and Neil Gaiman is kind of a big deal. Particularly a work as influential and as highly-regarded as Marvelman (which, I swear to God, I still keep calling Miracleman when I talk about this news at the shop, and keep wanting to type that name here as well). And, as Mr. Bissette mentioned, that John Totleben’s artistic tour-de-force that accompanied Moore’s final storyline is out of print is a damned shame. Should also note that Marvel wasted no time, in that they’re already selling the “MM” t-shirts in their online store, and soliciting orders for a Joe Quesada-drawn poster. I suspect DC already realizes that (given that they plan to reintroduce the characters in other DC Universe books) but I’m still curious how it’ll play out. 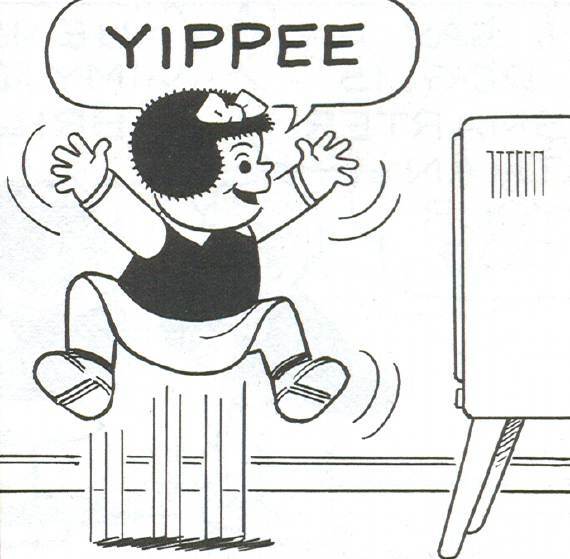 The biggest news from the convention, however, is Fantagraphics announcing the Complete Bushmiller NANCY reprint project. Judging by the number of people who’ve left comments about it on my site, e-mailed me, or even linked to me in their own announcements about the project, folks are assuming that I would be happy about this turn of events. My response was pretty much exactly like that, only I was wearing a shorter skirt. A couple more collections of Flickr pics from San Diego: Kevin Church brings the black and white, and pal Dana is cosplay ahoy! in her photos: here she is totally ready to exterminate you. So enough about the San Diego convention…it’s now all about Bully Con 2009!